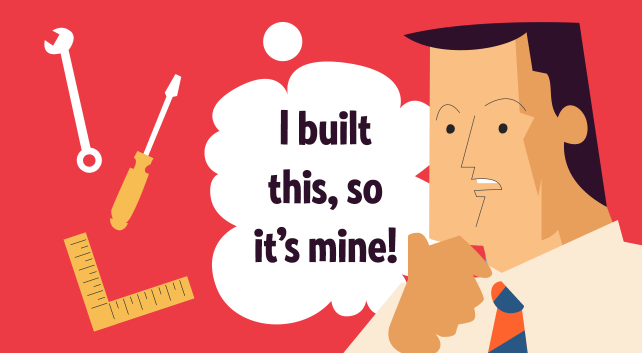 We hear a lot these days about “taking ownership.” You want your people to “own” the tasks they’re working on, “own” the results (good or bad) of those tasks, “own” their careers, “own” their jobs. In a classic experiment, he gave mugs to a group of people selected at random, then asked how much money they’d accept to part with “their” mug. The average price: $5.78. Then he and his colleagues asked another group of people – who hadn’t been given mugs – how much they’d be willing to pay to get one. This time the average price was far lower: just $2.21. In other words, the simple fact of ownership more than doubled the perceived value of the mugs. And that was for a generic low-value item that people hadn’t asked for, hadn’t selected, hadn’t paid for and had only “owned” for a short time. Employees who feel a sense of “ownership” over their jobs make a similar judgment. They see the job as more worthwhile and more valuable. That means, for example, that they’re more likely to be loyal and less likely to quit for another job that pays a little better. They’re also likely to believe in the value of what they’re contributing to the organization. If it’s seen as a job worth doing, it’s more likely to be done right. We feel more motivated to invest in what we own. If we own the house we’re living in, we’re more likely to fix up the kitchen or paint the front door. If we’re just renting, why bother? We’re not the ones who will reap the benefits. The same is true in the workplace. If we “own” our jobs, we’re more willing to go the extra mile. We recognize that the more we put into a job, the more we get out of it – for example, raises, promotions, recognition. People who are just “renting” their jobs won’t make those investments, because they don’t believe they’ll see a return. We connect what we own to our own self-image. We understand that what we own reflects on us. If our neighbor gets bitten by someone else’s dog, we feel bad. If it’s our dog, we feel responsible. At work, that dynamic is a powerful motivator to do well. If someone else’s presentation has typos, we may not even notice it. If it’s our presentation, it’s personal: We worry that we’ll look stupid. So how can you create a greater sense of ownership among your people? Ultimately, ownership is about control. If we own the coffee mug, it means we get to control what happens to it. We can put it on our desk and expect it to stay there. We can prevent other people from using it. We can use it as a flowerpot. We can take it home. If we choose, we’re perfectly free to smash it to bits. But it turns out that this relationship between ownership and control runs both ways. If we exert control over something, we’re more likely to develop a sense of ownership over it. To see how control influences psychological ownership, consider another series of experiments, involving online sites that allowed people to “build” their own products. When people were invited to “design” a T-shirt, scarf or cellphone case, they were willing to pay more for it than for a similar off-the-shelf product. This and similar experiments suggest that you can increase an employee’s sense of ownership by increasing their sense of control. For example, hold them accountable for results, but give them more flexibility on how to achieve those results. Instead of handing them a project plan, ask them to create the plan and run it by you. Instead of giving them a job description, ask them to define what they think their job should entail. Other experiments show similar results. In one, for example, children worked much harder and longer to solve a written problem when they were given a choice of which color marker to use. Similarly, even small choices in the workplace can contribute to a sense of control, and ultimately, ownership. Find every opportunity to offer people choices: When do they want to schedule the project meeting? What should be on the agenda? If several cubicles are available for a new hire, which one would she like to have? “Possession in Humans: An Exploratory Study of Its Meaning and Motivation,” Furby, Social Behavior and Personality: an International Journal, Vol. 6, No. 1, 1978, pp. 49-65 (17). “The ‘I Designed It Myself Effect’ in Mass Customization,” Franke, Schreier and Kaiser, Management Science, Vol. 56, No. 1, Jan. 2010.